In an office environment, it can be easy to forget a single common denominator – everyone is human. While productivity is important, the most successful and cohesive teams are bonded together beyond the walls of the meetings they attend. Six years ago, The North Slope School district in Barrow, Alaska began their strategic planning session with an activity well beyond the classrooms of the district. It’s important to understand that North Slope is culturally influenced by the Inupiaq Indian tribe. A subsistence hunting tribe, the community relies heavily on year-round hunting to provide nutrition and economic security. North Slope leveraged their unique cultural influence in their team building retreat. The school district flew the team across Alaska to give them an opportunity to do an activity which speaks to their culture yet isn’t something their specific geographic location provides. While very similar to traditional hunting, fishing provided the group with a challenging activity in a space that allowed them to connect with each other on a completely new level. The unstructured exercise made the group come together, define roles and management practices, and structure themselves to accomplish the task at hand. Whilst arms deep in fish guts, the team created a cohesive, interpersonal connection, making the group a closer unit. Six years later, the group returned to the Naknek River to complete another round of team building before they begin their strategic plan for the next five years. What stands out with North Slope is nearly 75% of the individuals who attended the first session returned for the second session this year – an accomplishment that shows the effectiveness of the exercise and the low turn-over of the district. The two day experience in the frigid Alaskan climate is a cornerstone in creating the district’s new plan. Stakeholders are reengaged and passionate about what lies ahead. This team-building activity rejuvenated the teams while also reenergizing the passion of North Slope’s stakeholders. Groups and people evolve, so it’s important to remember that your team must continually get together to build and change your team dynamic. In business, the human element of operations can be forgotten and this is one of the best ways to remind your team they are people, not just mindless work robots. To help you plan your next group exercise, we’ve built a list of quick tips planning your next session.Choose activities that relate to your team. Great teambuilding activities are ones which engage your team with their interests specifically. Activities that are unique to your geographic location, culture, or business are excellent in engaging your team in a way that relates to their lives beyond the office. Remember, some activities won’t be loved by everyone. This can be especially true if your teambuilding activities are athletic or public performance based. 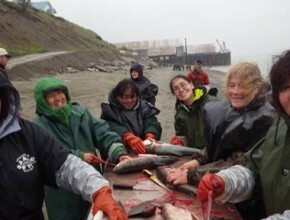 While fish guts worked for North Slope, it might not be loved by a team in an urban environment. Do some good beyond the office. Volunteering together can bring together a team and build camaraderie as your organization supports a philanthropic cause. It’s a win-win for your organization and a non-profit of your choice. Keep it appropriate. While you might be out of the office, it is still important to keep a level of professionalism with your colleagues. Not to say you can’t loosen up, but what may be appropriate in your group of friends may not be appropriate with your co-workers.